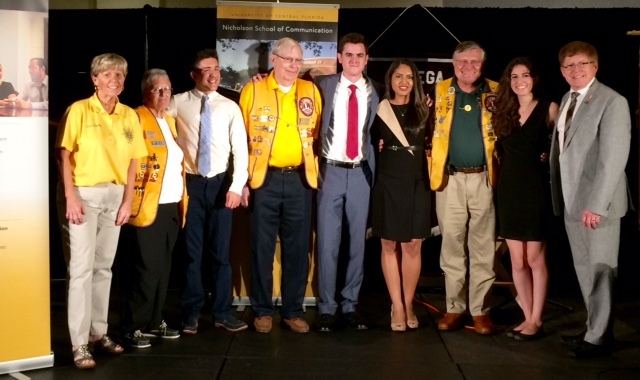 Members of the Oviedo-Winter Springs Lions Club pose with four student co-anchors featured on the live telethon sponsored by the UCF Nicholson School of Communication and Lions Clubs International Foundation. An amazing event occurred on the University of Central Florida’s campus early in November, 2016 when a group of volunteers—mostly from the Radio/TV program—decided they wanted to do something for the people who had been affected by Hurricane Matthew. The initial interest came in part because the Nicholson School of Communication has begun its Hispanic Media Initiative and many students in the program are of Hispanic origin and wanted to do something to benefit people with whom they shared their heritage. Their idea was to host a telethon to raise funds for disaster relief. It was serendipitous when they asked if I knew of an agency that might want to partner with them. I suggested the Lions Clubs International Foundation and once they knew of LCIF’s practice of channeling 100% of donated funds to the people who need help, all aspects of the project came together. 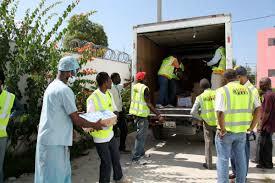 LCIF has a history of providing disaster relief to people in Haiti. Photo courtesy of LCIF. Students and faculty signed on to help. In addition to handling all of the local arrangements, moving equipment, and preparing for two hours of live television, the students made contact with several LCIF departments, including: The IT department to work out how they could get a special login for online donations; and the marketing department to get access to information about Lions and their activities. 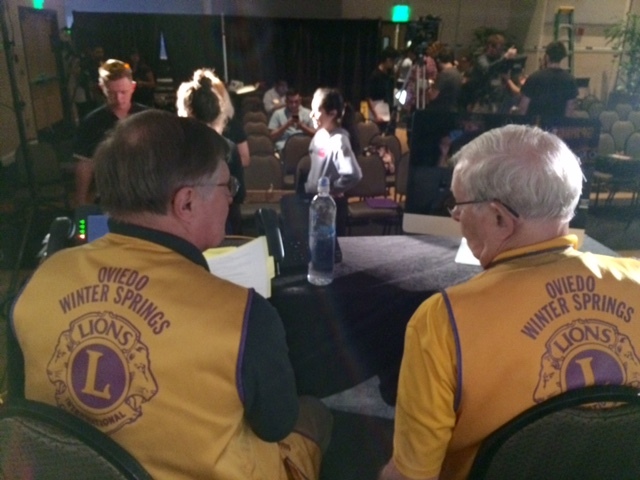 Looking out from the telephone bank to the studio audience, Oviedo-Winter Springs Lions (L-R: Lion Dennis and Lion Ted) prepare to take calls from interested donors. The local Oviedo-Winter Springs Lions Club arranged for some volunteers to be on hand to take the calls and input information into the LCIF website. Each of the volunteers was interviewed and the students credibly spoke about the activities of LCI and how it was so important to support LCIF to provide disaster relief. Lion Pat shared her story of how she lived through Hurricane Sandy that destroyed her home. Lion Dennis provided information about what Lions do and how to become a member. Lion Ted talked about the “Right to Sight” project that has made such an impact in central Florida. Lion Kathy provided a “first-timer’s” hurricane experience and why supporting LCIF was so important. We all were so impressed with the professionalism and preparation of the students as they moved smoothly in and out of the interviews! On the day of the event, the students had negotiated a space for the telephone, acquired telephone lines, written scripts, prepared videos and graphics, and arranged for local talent to perform. 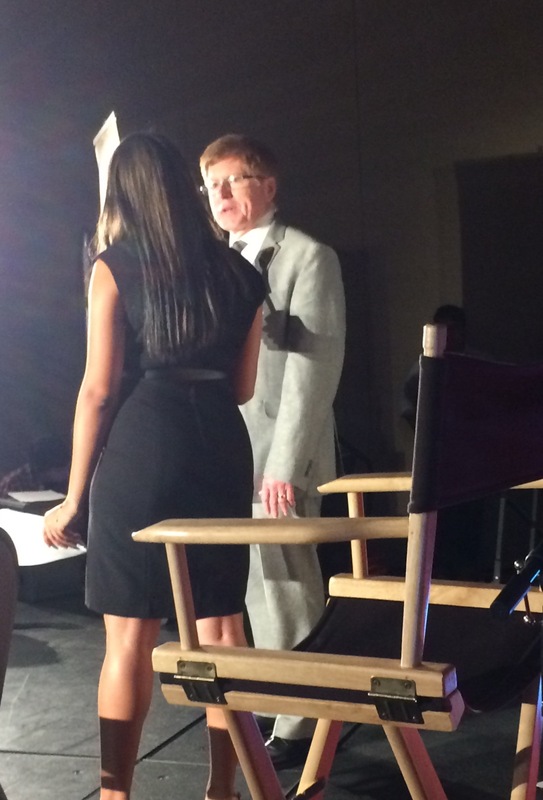 LCIF Trustee Robert Littlefield was interviewed about how disaster funds are distributed through local Lion efforts. The telethon lasted for 2 hours and raised in excess of $1,500. As of the time of the telethon, LCIF had made eight $10,000 disaster relief grants to communities where Lions were initiating efforts to help the victims of the hurricane. I am so proud of this effort because the students made it happen, LCIF partnered with the technology, and the campus supported a student-run, “live” telethon for the first time in University history. What made the accomplishment even more impressive was the fact that the entire event was staged away from the TV studio. The result has been an interest by students who were involved to find out more information about how to start a campus Lions Club at UCF. Efforts are underway to meet with students who want to form a club to serve their campus and surrounding community to give back. At the end of the day, what a great event. Thank you to everyone who made it happen. What a wonderful way to keep spreading the “news.” Good for all of you.